Have you had carpet spots reappear after you’ve cleaned them? It could be due to a condition called “wicking” which causes soil to move to the surface as carpet dries. 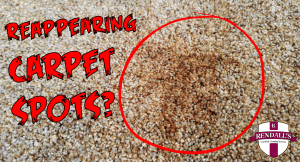 What are Reappearing Carpet Spots? There are several layers to your indoor installed residential carpeting: the carpet pile, the backing (2 backings, actually – the primary and the secondary), the padding, and the subfloor. When a spill occurs, gravity pulls the spill down through the carpet fibers where it may eventually soak down into the carpet backing, then the padding, and, given enough moisture, even the subfloor. On some residential and many commercial carpet installs, the carpet is glued down directly to the concrete subsurface without a pad. Wicking also occurs in these installations from collection of contaminants in the backing and subfloor. Why do Reappearing Carpet Spots happen? What is happening is that the left-over contamination below the area that is cleaned moves up to the surface as it dries. Carpeting always dries from the bottom up. So if you have residual contamination in your backing, pad, or subfloor, there’s a good chance that eventually the residue is going to wick its way up to the surface of the carpeting. Wicking often occurs with oil based spills like coffee, cooking oil, salad dressing, etc. You’ve spilled your morning coffee and you blot it up the best you can, use a carpet spot cleaner (our clients love our Stain Fu carpet spotter), and dry the area with a fan, only to see the spot reappear. Believe it or not coffee can be considered an oil based spill, even though it’s a liquid with mostly water. There is an oily film which surrounds coffee beans called “tannin”. Tannin has the tendency to stay oily and wick back up into the top of the carpeting as it dries, even after seemingly successfully removing the coffee spill. So you may clean up the spill several times from the top side only to have the coffee spot reappear the next day. Anytime you re-wet the top side of the carpeting, you expedite the wicking process. As much as you may try and not to get the backing wet, it may become just enough dampened to wick the tannin residue from the bottom to the top. How do I know it’s wicking? One way to find out if its wicking is to inspect the cleaned spot after drying. Look at the fibers themselves. If the top third of the fiber is affected but the bottom third looks just fine, then that tells you that it is wicking. How do I prevent wicking? One sure way to prevent wicking is by making sure that the pad (and perhaps subfloor as well) is cleaned or replaced. The other way is to do a top side weighted drying system. Instead of having the carpet become the last thing to dry, use towels. Stack 4-6 white terry towels and put something heavy on top of the towels like a heavy book, weight plate, or a brick. The spot will wick up into the towels as it dries. Make sure you use white terry towels to prevent any risk of color transfer. Also be aware that whatever heavy object you use to weigh down the towels may get damaged by humidity or moisture wicking into it, which is why we recommend using a brick or rubber-coated weightlifting plate, if possible. When I'm not running the most exciting and extraordinary cleaning company in the universe, you will find me organic farming, practicing Hangul (Korean), and studying history. Sign me up for your e-newsletter!